Spring has arrived here in Texas, and lots of fresh berries are arriving in the Produce department of my local grocery stores. I enjoy eating and cooking with sweet, juicy berries this time of year...and my very favorite berries are from Driscoll's. They're consistently sweet, juicy, and at peak ripeness. The nice folks at Driscoll's recently asked me to create a fun Springtime dessert showcasing their berries, and I jumped at the chance! I knew that I wanted to make something light and refreshing that allowed the sweet berries to take center stage. I'm in love with my individual trifle cups and decided to create another original mini trifle recipe. 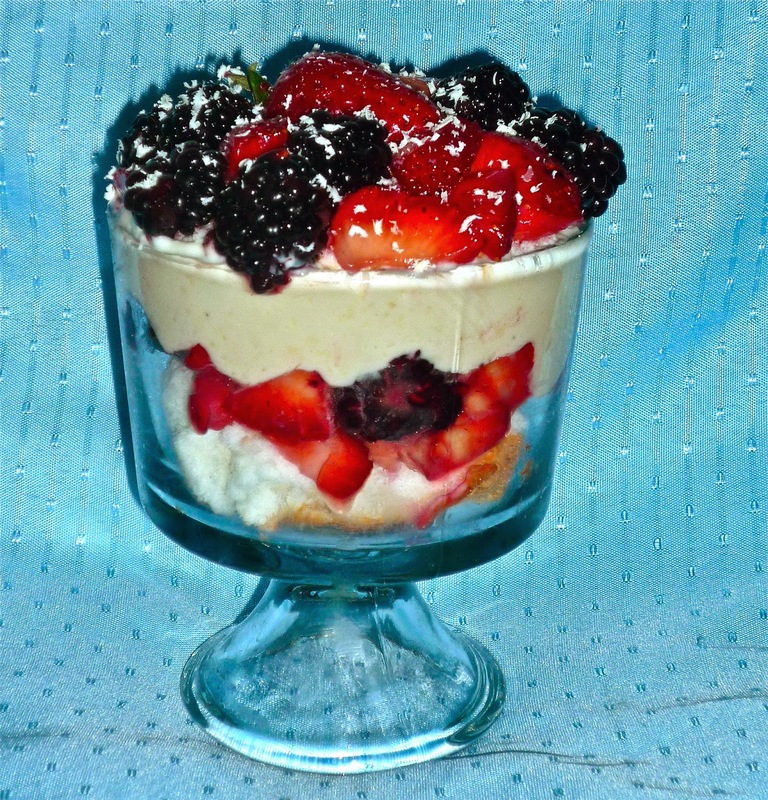 My White Chocolate Cheesecake-Berry Trifles use cubed angel food cake, because it's lighter in fat and calories -- something many of us are thinking about as bathing suit season draws near. Strawberries were a must, and I paired them with blackberries...also known as dewberries here in the South. I grew up eating them and love them! The cheesecake filling is made from cream cheese, half and half, and a healthy dose of melted white chocolate. Put it all together, and you've got a fabulous Springtime dessert that's perfect for Easter this weekend. Even better? The individual components can be made up to a day ahead, saving you time in the kitchen on Easter Sunday! Step 1: Prepare the angel food cake according to package directions and cool completely. Cut the cooled cake into bite-sized cubes with a serrated knife and set aside. Then, add the strawberries, blackberries, vanilla, limoncello, and sugar to a large bowl. Stir well to combine and refrigerate for at least 30 minutes, allowing the berries to release their juices. Step 2: Add the whipped cream cheese, half-and-half, vanilla extract, sugar, and melted white chocolate to another large mixing bowl. Whip the ingredients with a mixer until the mixture is fluffy and nearly doubled in volume. Refrigerate the filling for at least 30 minutes before assembling the trifles. The first two steps can be completed up to a day in advance, if desired. Step 3: To assemble the trifles, layer cubes of angel food cake in the bottom of each trifle bowl or wine goblet. Top with 1/2 cup of the berries and a bit of the flavorful juice. Spoon 1/2 cup of the cheesecake mixture on top of the berries, using an offset spatula to spread it evenly. Top with another layer of angel food cake cubes and an additional 1/2 cup of the macerated berries. Grate the reserved 1 ounce of white chocolate on top of each trifle. If desired, add a dollop of sweetened whipped cream on top of each trifle. That's it, folks! Layers of angel food cake, white chocolate-infused cheesecake filling, and sweet-tangy berries combine for an ideal Springtime dessert! The filling is creamy and a bit decadent, but it's tempered a bit by the light-as-air angel food cake and fresh berries. This one has lots of eye appeal thanks to the layers and vibrantly hued berrries. Make sure to serve these trifles with spoons so everyone can get a bit of all three layers with each bite. If you prefer to make this a dessert a centerpiece of your Easter dessert table, simply use a full-size trifle bowl instead of individual ones. 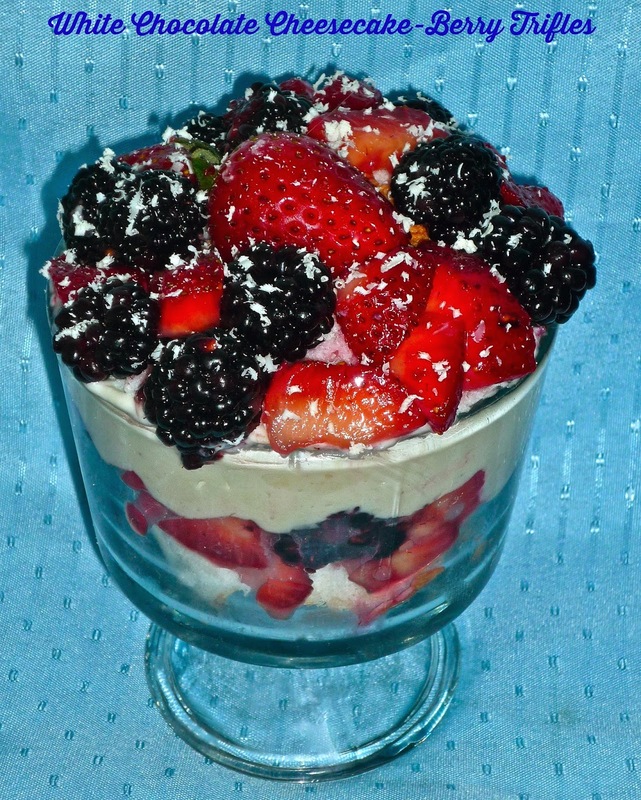 You can also feel free to use any combination of berries that you like best for these trifles. For example, blueberries would work perfectly with the strawberries for both Memorial Day and July 4th BBQs and picnics! No matter the berry duo you choose, I hope you'll give this dessert a try very soon. Disclosure: Driscoll's provided me with berries to facilitate this feature and recipe creation.